For those of you who aren’t aware, after many overdue years, Canada updated their totally out-of-touch food guide previously based on a pyramid structure of food groups. 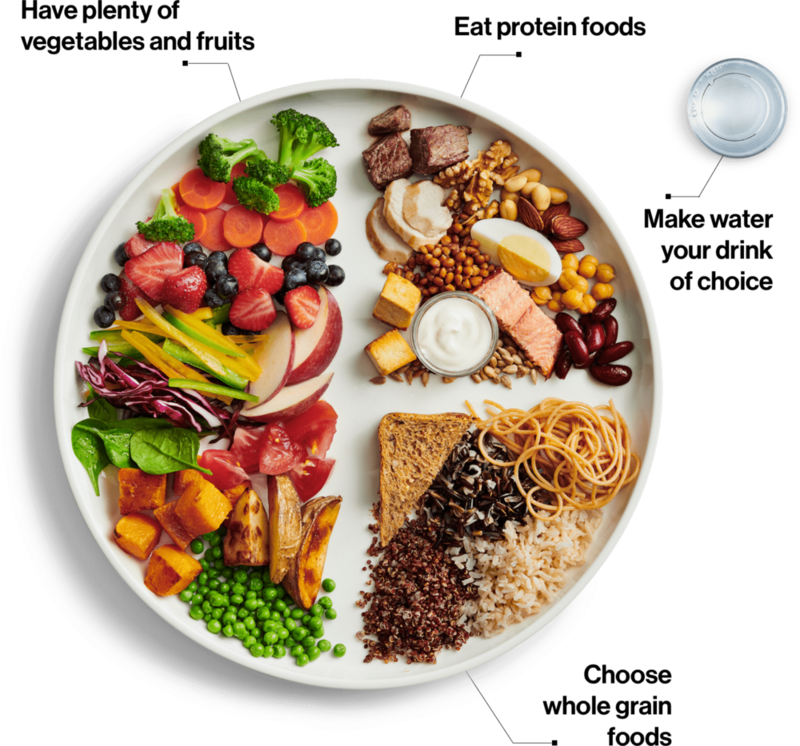 The new guideline is based more on a “what your plate should look like” approach and incorporates some other suggestions and concepts, previously neglected in the original design. There are no discussions regarding food sourcing and quality, which is imperative to the nutrient content. I’ve said it 100 times before and I’ll say it 100 times again: how something is cultivated or raised significantly effects the way in which it interacts with our bodies. When fruits and vegetables are grown in degraded soil, picked before ripeness, and/or transported over long distances, this will greatly diminish the vitamin and mineral content within (let alone the longevity and sustainability of our farming system and environment in general). An animal that is raised in a pasture (or of course the wild), eating its natural diet without being subjected to drugs, trauma, and unnecessary disease exposure is a completely different story than one that has been raised in a cramped pen, fed cheap crappy grains, and pumped with toxins. It’s not just about ethics (which is super important obviously), it’s about nutritional value and the actual chemical makeup of that food. The other topic they’re obviously missing is the discussion of bioindividuality. As you know (because I go on and on about it), every body is different and to say everyone should eat the same thing at all stages of their lives is seriously flawed and problematic. Some people do well with grains, others don't. Some people do well with legumes, others don't. Some people need more fat and protein in their diet, others thrive on a diet with a bit more of an emphasis on complex carbs. I have worked with plenty of clients who do great with a higher carb approach incorporating properly prepared whole grains and legumes, as well as many clients who were finally able to overcome their health challenges once they eliminated grains and legumes and started eating more animal-based proteins and fat…including saturated fat my friends! I promise you, it’s NOT the enemy! Literally no properly executed modern study shows that saturated fat is bad for us, and in fact studies prove the exact opposite (I’ve included a helpful link below, but also feel free to email me if you’d like more info on this). Our past health considerations, present paradigms, and future wellness goals make up our unique nutritional requirements, and the best way of constructing a "food guide" is to work with trusted professionals who can examine those nuances with care and adaptability…AND of course provide you with the tools to become your own wellness advocate…to learn how to read the information your body is giving you in regards to what it needs/when it needs it, and to appreciate the many facets of our wellness, body, mind, and soul. Further Reading: Bio-Individuality: You're One of a Kind! With that all said, I’m also not crazy about the recipes they have posted and are recommending on their website. In a similar vein to my frustrations above, they don’t offer very good resources for people avoiding grains, or trying to reduce their carb-load, or who need more fat and protein in their diet. I don’t consider their suggestions to be all that nutrient-dense and there is a clear bias towards plant-based high-carb dishes, which once again is totally fine if that’s what you thrive on, but not everyone does and they are not providing great alternatives for people who don’t tolerate grains, legumes, and carbohydrate-rich foods very well. Now of course, I recognize that it’s a challenge to cover concepts of sourcing and bioindividuality in a national food guide. I get that people want black and white, yes or no, clear rules and strict parameters. But sorry folks, that’s not how our bodies work! Exploring a blueprint is a great start, but know that you will have to adapt any guideline to your own wellness goals and considerations. Please don’t follow anything blindly. Be curious, ask questions, understand that our bodies are constantly changing and something that works for others might not work for you. Something that worked for you in the past might not work for you now. And remember, especially when governments are involved, there’s often an influence based on money, power, and politics, and large corporations have more sway in these sorts of things than you might care to know. Above all, if something doesn’t seem right to you, it’s probably not right for you. You have the power and autonomy to decide what you put in your body - honour that choice, trust yourself, and be open to the inevitable ebbs and flows of life. I’m not going to lie, I threw this post together quite hurriedly based on the desire to share my thoughts with you as quickly as I could (like I said, I was getting so many questions and wanted to address them in a timely manner). However, due to my haste, I completely missed a huge part of the conversation, that is sadly neglected more often than not. That is the topic of accessibility. While the new Canada Food Guide offers sections on budgeting, planning, and prepping, once again their main suggestion for budget-friendly protein is to eat beans, lentils, and chickpeas. I cannot emphasis enough that while these might be great foods for some bodies, they are not ideal for all. Especially people who don’t tolerate starch very well, or are struggling with issues regarding inflammation and digestion, all of which, for example, are very common considerations within Canada’s aboriginal community, a marginalized group who struggle with monetary accessibility and therefore would benefit from budget-mindful resources that take into consideration their needs. Another issue of accessibility (that also vastly effects the aboriginal community), is the Canada Food Guide’s pretence that certain items are actually available to people. In some remote communities, folks might not have as much access to fresh fruit and vegetables or minimally processed packaged foods that, for obvious reasons, often have a shorter shelf life. Yes, the processed junk has a longer shelf life because of toxic additives (which the new food guide thankfully advises against), but if that’s all you’re working with, it’s hard not to go in that direction when you’re hungry, have limited funds to spend on food, and that’s all you know. Which leads me to be next point: education. The new guide actually has some great educational resources and I whole-heartedly applaud the effort. I truly feel (despite some of my frustrations with their actual recommendations) that this is a great start. Now let’s encourage our government to consider providing even more resources and comprehensive educational sessions for low-income and marginalized groups! Something that isn’t a printout, but an integrated aspect of our system that delivers multi-part lessons and learning opportunities regarding nutrition, grocery shopping, cooking, and food budgeting to set people up for long-term sustainable wellness. Let’s have more involvement of trained nutritionists who understand an individual approach not only in terms of biology and physiology, but also accessibility and culture. One of the vastly overlooked aspects of the Canada Food Guide is ancestry, which definitely falls under my previous comments regarding bioindividuality. I’ll say it again (because I will never get sick of reminding people of this): our past history, present conditions, and future goals vastly effect what we should be eating. If someone comes from a lineage that has consumed a tonne of rice for centuries, their body will likely do better with rice than someone who comes from a lineage that survived primarily on animal fats and proteins. This latter example is definitely more so where the indigenous peoples of Canada fit in, and the relatively swift and careless introduction of high sugar foods and beverages, including alcohol, has had a devastating effect on their health and wellness. When you have a group of people whose physiological design based on generations of incredible human adaptation and survival doesn’t do as well with starches and sugars, but instead thrives on a diet of animal fats and proteins, and are telling them they should be eating grains, legumes, fruits and vegetables, and then add on top of that limited accessibility to fruits and vegetables, so that they may only be eating legumes and grains, you’re not really setting their bodies up for success. And this isn’t even taking into consideration the education holes and challenges that low-income marginalized groups already face. Once again, these are massive topics and I actually don’t fully expect them to be explored in the capacity that the Canada Food Guide allows. However, what might be a positive step in the right direction is shifting the language, altering the approach, and adding in clauses that at least nod to sourcing and quality, bioindividuality and ancestry, and accessibility and comprehensive systematized education. It’s a big ask, but I think we can do it Canada! I’m very much impressed by the awesome changes I’m already seeing and am hopeful that slowly but surely we can expand our scope of nutritional knowledge and guidance that, as best as possible, includes different perspectives, and allows for the greatest amount of inclusivity.